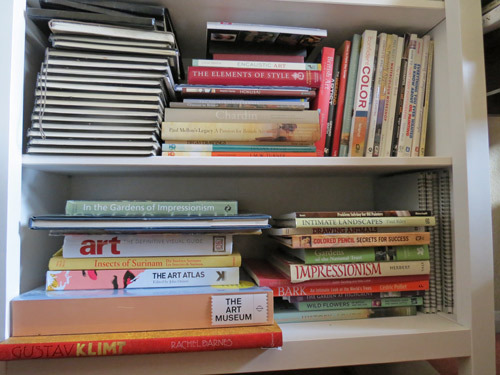 Making a Mark Reviews: Hemnes Bookcase x 4 for "The Art Library" #2 - RESULT! Can it cope with big heavy art books? The answer appears to be Yes! 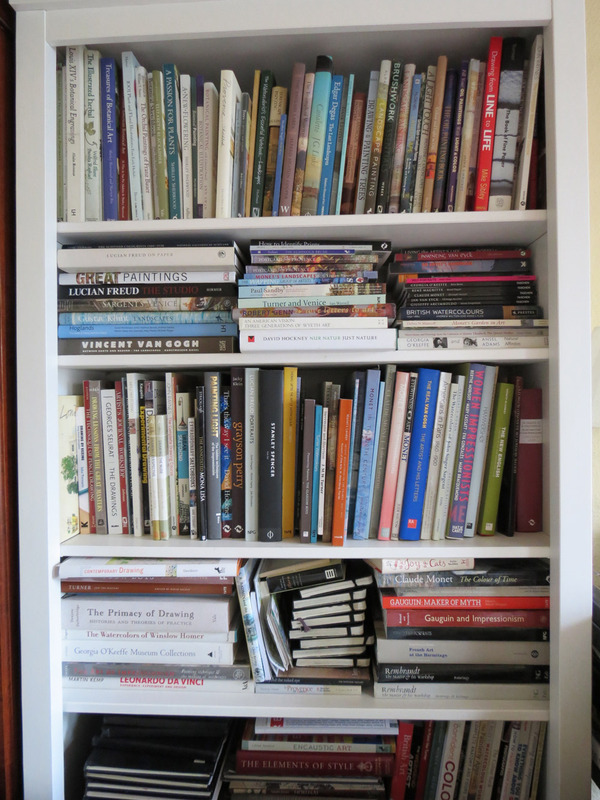 My art books tend to be hardbacks - in other words they're big and heavy. Consequently I was very concerned I bought a bookcase which could cope with the weight. This bookcase is made of solid wood which is painted white - apparently with an acrylic lacquer. I took a look at the shelves are we were putting it together and the shelves are actually glued strips of wood which are close grained. I've got a strong impression from something I read or watched that this makes the shelf even stronger. I very much like the fact that the product specification says that each shelf can hold 30kg in weight. That's 66.14 lb for those that don't do metric! So far they seem to be coping very well with the art books. There are no signs at all of shelves bowing under the weight. These bookcases are also flat on the side and hence can be lined up next to one another to give a continuous run of bookcases without a gap. That means no odd visuals and no awkward gaps. I very much appreciate that the legs of this bookcase have got adjustable feet built in - which given my sloping floors in a house built in the 1840s - are very welcome. We originally planned to make up two bookcases on Friday - however our visit to IKEA turned into a mega seduction event and then we got caught up with a bad traffic jam on the way home so Thursday turned into a very long day. What do I think of the Hemnes bookcases? First off the bookcase in the store was exactly what I expected from the catalogue - which is always reassuring! I was hugely impressed with the way in which the pieces have been engineered and the way it does together. On this basis I will have no hesitation in buying more. All the pieces fitted together perfectly and with very little effort on our part. It only got energetic when we got to hammering in the panel pins for the back. the instructions were very easy to follow - they even tell you what NOT to do. I would say we got a lot of benefit from having watched this video first about how to build an IKEA Billy Bookcase. Although it's a different bookcase, a lot of the principles and ways of building the bookcase are the same - and it helped to make the instructions even easier to follow. The only thing I could suggest which would have made it a better experience would be to have instructions on a sticker on the outside - or on the webpage - telling you precisely which tools you need before you start (or leave the store). As it happened I had all of them - but I think I might have got a tad frustrated if I'd found I hadn't after I'd unpacked the bok of goodies. Make sure you have the bookcases delivered. They are absolutely HUGE when packaged and also weigh a lot (remember this is a full size wooden bookcase). We are moving them around prior to unpacking very, very slowly! They are also very well packed so there's quite a bit of packaging to get rid of. Use a tray with a lip all round on which you keep your tools and the instructions and the bits and bobs which put it together. This makes it easier to work out where you put that screwdriver down! Use a container for all the bits which fasten it together! After counting out and checking that we had all the wood dowels and others bits and bobs we emptied them all (except the panel pins) into a container with sides so we could find them easily and they couldn't get lost or run away easily. We used a saucer for the panel pins. Bottom line - Having had a great experience with the first one going together so easily means that the fact that we now need to put together three more bookcases holds no trepidation. However we would recommend taking it nice and slow on the first one. You could easily build more than one in a day if young, fit and healthy and able to move rather faster than I can! Do the art books fit? The bookcase has one fixed shelf in the middle and four adjustable shelves. 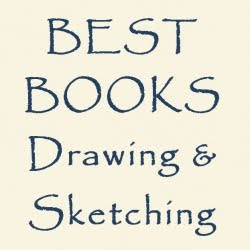 There are a few options as to positions and I found one which suited the average size of my larger art books. Once we had it upright I tested out an average size hardback to work out how to organise the shelves. Ideally, the Hemnes would be a slightly taller bookcase so that I could get ALL my full size art books to stand up on every shelf. I found I had to compromise and have a couple of shelves where the books are lying horizontally - but's it's really no big deal. The only thing I get very uptight about is books hanging off shelves because they're not deep enough. A better test is The Art Museum which is an enormous book (18.7 x 13.7 x 2.8 inches) and hugely heavy (18.4 pounds). That fits on the bottom shelf perfectly - lying down. Do these units have any gap at the back to run cables? No gap at the back but they do stand on legs so you run cables underneath. Plus the shelves are wood which means you can adjust a corner to create a cable run down through the shelves. We have a number of IKEA units and just drill a hole in the back for wires. Easy to do.